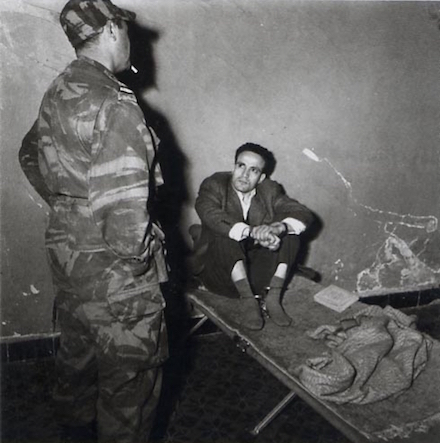 On this date in 1957, Algerian revolutionary Larbi Ben M’Hidi — more familiarly referred to as Si Larbi or Ben M’Hidi — was extrajudicially executed in French custody. He was one of the founders of the militant nationalist National Liberation Front (FLN) and was a critical commander in the guerrilla war against French occupation, the Battle of Algiers. Small wonder he also features prominently in the cinematic masterpiece of the same name, where he and his opposite number, the French Col. Mathieu, are bracingly clear-eyed as to their respective sides’ necessary forms of terror. In this scene,* for instance, the captured Ben M’Hidi is asked by a journalist whether it is not cowardly to have women kill people with bombs hidden in their baskets. This exchange adapts a conversation that “Col. Mathieu’s” real-life model, Marcel Bigeard, reportedly had with his prisoner over dinner. Bigeard respected Ben M’Hidi too much to torture him but the French brass was not so sanguine — perceiving that the Algerian would present a great danger to the occupation as a political prisoner. This was a dirty war, and men like Ben M’Hidi met dirty fates. Major Paul Aussaresses,** the officer eventually tasked with dispatching the revolutionary, described how it happened in his The Battle of the Casbah: Terrorism and Counterterrorism in Algeria 1955-1957. Ben M’Hidi didn’t want to cooperate and Bigeard knew full well what the consequences of such a refusal would be … would he have talked under torture? We knew that Ben M’Hidi was responsible for most of the attacks and that he deserved the gallows ten times over, yet it wasn’t absolutely certain that he would be found guilty in court. “So what do you think?” asked Massu. I understood that Massu already had the government’s approval to proceed. I picked up Ben M’Hidi the following night at El-Biar. Bigeard made sure he was somewhere else because he had been told ahead of time that I was coming to take the prisoner away. I came with a few Jeeps and a Dodge pick-up. There were about a dozen men from my first squad, all of them armed to the teeth. Captain Allaire was in charge and had a little combat group lined up and presenting arms. I asked him to go get Ben M’Hidi and hand him over to me. “Present arms!” ordered Allaire, when Ben M’Hidi, who had just been awakened, was escorted out of the building. We stopped at an isolated farm that was occupied by the commando unit belonging to my regiment and located about twenty kilometers south of Algiers, on the left off the main road. A pied-noir had placed the farm at our disposal. It was a modest building and the living quarters were on the ground floor. My second team was waiting for us there. The commando unit of the 1st RCP included about twenty men, some of whom were draftees, but all of them were completely reliable. Captain Allard, nicknamed Tatave, who was very much devoted to me, was in charge. I had told him what was going on and he had been briefed. I told him to have his men set up in a corner of the room where Ben M’Hidi would be placed. The farm was messy and they had to move a few bales of hay around and sweep the floor. While this was taking place the prisoner was kept isolated in another room, which had been prepared. One of my men was standing guard at the door. Then I entered with one of the soldiers and together we grabbed Ben M’Hidi and hanged him by the neck to make it look like suicide. Once I was sure he was dead, I immediately had him taken down and brought the body to the hospital. Following my orders, the NCO who was driving left the engine running while the car was parked, in order to be able to drive off at top speed without volunteering any explanations as soon as the emergency room doctor appeared. It was about midnight. Actually the report didn’t make sense for very long. Massu called me to his office a few days later. I therefore paid a visit to the judge’s office. The district attorney was absolutely enraged. I think that had I slapped Reliquet across the face it would have had less of an impact than that answer. I put my beret back on, saluted him, clicking my heels, and walked out of the room. We never heard from the district attorney again after that. The death of Ben M’Hidi was a decisive blow to the FLN in Algiers. The attacks died down and the bulk of the rebels began retreating toward the Atlas Mountains near Blida. We used the farmhouse again where Ben M’Hidi had been executed. I had the men dig a long ditch and some twenty bodies, including that of a woman, were buried there. The French military’s success by 1957 in the Battle of Algiers did not clinch its fight to retain Algeria — which attained its independence in 1962, to the horror of the far right. But it did put the army in such a vaunting position vis-a-vis the civilian authorities — one can see it in Aussaresses’s disdainful treatment of Reliquet — that the generals would author a 1958 coup led by Gen. Massu himself which called Charles de Gaulle out of retirement and initiated France’s Fifth (and current) Republic. Larbi Ben M’Hidi’s name today graces one of the main thoroughfares of Algiers. * The full film is a must-watch and can often be searched up in the usual places. This press interrogation occurs about 88 minutes in … closely followed by a scene of a spokeman announcing that M’Hidi “hanged himself” and Col. Mathieu allowing that he “appreciated the moral fiber, courage and commitment of Ben M’Hidi to his own ideals. Notwithstanding the great danger he represented, I pay tribute to his memory.” Game recognizes game. ** Eventually, General Paul Aussaresses … although he’d be stripped of this rank (and of his Legion of Honor) for celebrating the use of torture in Algeria in The Battle of the Casbah. viz. William Rawson, Charles Buckler, Ralph Harrison, and Henry List, As Also The Last Dying Words OF Thomas Fallowfield for Murdering of Mary Smith alias Hunt, who was Executed at LEICESTER-FEILD, Joseph Coates for Felony, Cap. George Baker, George Saunders, and William Mullins, for Robbing on the High-way, was Executed at TYBURN. On Wednesday the 4th. day of March, 1684. IT is sad to Consider, (that notwithstanding the frequent Examples of publick Justice on Capital Offenders, for the warning of all others, to Avoid the same Crimes, yet) that in the short Intervale of time from the former sessions, there should be such a Confluence of persons now Condemned. It is probable, that they did presumptuously hope for a General pardon at this sessions, tho they did Gracelesly antidate an Act of Royal Grace and Mercy to Incourage themselves in their Impieties. This may convince obdurate Sinners of that Secret Atheism which Reigns in their Hearts, by Crying up false peace and safety to themselves, whereby they are frequently made Exemplary in a publick and shameful Death. 34. of Job 26. 27. Ver. He strickes them, as wicked men in the open sight of others, because they turned back from him and would not consider any of his ways. After the Sentence of Death past on the aforesaid Criminals on Friday the 27th. Instant February, they were Visited on Saturday, to bring them to a Conviction; of their Sinful and Deplorable Convictions; and in order to their more serious preparation, for those Prayers and Exhortations, which were to Follow on the next Lords Day. In the Forenoon a Sermon was Preached on the 17. of Genesis, and the first Verse: Walk before me, and be Perfect or Upright. In the Afternoon of the same Day, a Sermon was Preached on the 11. Chap. of the first Epistle to the Cor. and the 31. Verse: For if we would Judge our Selves, we Should not be Judged of the Lord. From which Text, the Ordinary offered to their Consideration, that self Judgment and self Condemnation, in the Impartial Acknowledgement of the Equity of the Divine Law-giver in his process of Judgment, tho most Severe, as the Righteous Demerit and result of the least. Sin, is the only ready and sure way to escape that Divine Wrath, which is Impendent over the Heads of Sinners. In the Progress of that discourse, especially at the practical Improvement of it, to the present Condemned, they seemed to be much awaked from their Security in a Sinful state, to preserve Increase any signs of Contrition, the Ordinary Visited them again on Munday, and after Payer, for them, Exhorted them to search their own Hearts, that they might discover for what special secret Sins, God had been provoked to withdraw his preventing Grace, so as to leave them to commit those Hinous Crimes, in which, they have wilfully insnared themselves. On Monday and Tuesday, the ordinary after Prayers, Inquired into their former manner and course of Life, and how they now stand affected under the Sentence of Death, and prospect of that Eternity into which they are Launching: whither they Repent of their Sine and the Excesses of their Youth and a Debauched Life, be as bitter and Loathsome as at any time before they were Delightful. Of which Conferences with them apart, which are most affective of them, the Ordinary now proceeds to give a True and Impartial Account, taken from their own Mouths in Wrighting. William Rawson, he was Born in Cumberland, is 27 Years of Age; he was Educated at School by his Parents, in order to have been sent to the University, as being of Good Natural Parts, and was hopeful in the Improvement of them: But his Parents not being afterward of Estate Sufficient, to perfect their Intention of forming him for an University, himself also growing Remiss in his Learning, he came to London, where he stayed for some time with a Gentleman of Good Repute: but not answering his Expectation, he went back into his own Country: where continuing for some good space of time; he lived in Idleness; yet presumed at last to Marry, tho he knew not how to provide for the necessary support of that Condition: so becoming very Poor, he faith he sought for Imployment in London; but about a Month past, he was so unhappy as to grow acquainted with Bad Company, who Tempted him to many Miscarriages; particularly to associate himself with them in Robbing on the Highway. He confess’d himself guilty of the Crime he stands Condemned for, yet being g’d to make Acknowledgement how long he had used Highway Robbing, and who Tempted him first into such a Dissolute course of Life, he made no other reply, but that they were fled beyond Reach and would not name any particular Person, tho he ought to have broke the Combination by a Discovery. He said he had been many ways Sinful, but he hoped by Repentence through christ’s Merits, the Lord would Pardon him, and receive him to his Mercy. George Saunders, he was Born in Ireland, of Protestant Parents, in Limbrick; by them he was sent to School, to sit him for future Imployment; but there he behaved himself like a very Unlucky Lad; afterward he was put an Apprentice to a Weaver, in whose Service he remained for some time, but leaving it off, he Waited on a Gentleman: whom deserting he eutred himself into the Kings Service, and was a Soldier in Tangier for the Space of four Year: after that, he Lifted himself in the Queens Regiment, but meeting with ill Company, he was enticed out of that Imployment; and said it is not past three weeks or a Month since he left that Service. He Acknowledged that he had been given to Intemporance, and had often taken God’s Name in Vain, yet he Prayed to God sometimes to keep him from Evil Courses. It repented him that he left the former Imployment of a Soldier, saying that was the occasion though Idleness of exposing him to be Tempted to Rob on the Highway. He also particularly confess’d the Crime he stands Condemned for. He much Lamented his illspent Life, and gave the ordinary very Hopeful signs of the Truth of his Contrition, earnestly desiring him to pray for him, and promised to be very Compliant with his Directions, in order to Eternal Life. William Mullins, was Born in London, of Godly and Religious Parents; he was well instructed and Educated by them and thereupon Acknowledged his Sins to have been the Greater and more Aggravated because be had Sinned against much Light and Knowledge: for he said Where much is Given, there also is much Required. He Confess’d furthermore that he had been a great Neglecter of God’s Worship and Service on the Lord’s Day; a frequenter of and associate of ill Company; and for that he had omitted a due Attendance on those two great means of Grace and Salvation, Prayer and Preaching, he judg’d it was for that God had left him to himself, and suffered him to become Guilty of so great a Sin as that he was Condemned for. And being urg’d to a more Particular Confession of his Crimes, he said they had been so sundry and so many, that he could not enumerate them: but as for the particular sinful Fact for which he was now to Dye, he owned he was guilty of it; yet withal added that ’twas the first Felony he was ever engaged in. He Reproved one of his fellow Condemned Criminals for the lightness of his Spirit, in smiling when press’d to a free Ingenuous confession of his Offences, and said, I am afraid he has little sense of his Sins; ’tis hope of a Reprieve which makes him less Serious, but persons do ill who give him those Hopes, for it may make him backward in the works of his Conversation: and were he fit to Dye, he were the siter to Live, He said he acknowledged the Justice of a Righteous God, in bring in him to this his deserved Capital Punishment, and that he little mattered Temporal Death, so that he had Comfortable Expectations, that would prove, unto him an entrance into Eternal Life: and added moreover that he was now equally desirous of Inward Sanctification and Holiness, as of endless Glory and Happiness. In short, he shewed great outward signs of a True and Internal change of Heart, and Godly sincere Sorrow for his manifold Transgressions; hoping for the forgivenes and remission of the guilt of is them, in and through the alone Merits and satisfaction of his Crucified Saviour. Joseph Coates, was Born in York-shire, he is now 31 Years of Age; he was educated at York, and Tadcastle, as himself called it, where he went to School: afterward he lived in the Service of Squire Thyn for the space of six years; after that, he went with the Lord Orory into Ireland, and stayed with him only half a Year: after that he served the late Earl of Essex, as his Footman, in Ireland: afterward he came into England and Served, Col. Fitz Patrick, but left his Imployment Under him. Two Years last past he Was an Horse-Course; after he laid down that way of Livelyhoods he intended to go into Staffordshire for Imployment, but altering his purpose, he fell into bad Company, upon neglecting the Service of God, soon after he grew very Wicked, was given to Excessive Drinking and Swearing; at last he was acquainted with three Men, who Tempted him into the Burglary, for which he stands Condemned, but expressed not their Names to the Ordinary. Being asked what hopes he had of a future Happy State, he replied that he had been a great Sinner, but now his Heart was through God’s Mercy made to Relent, more for his Wicked Practices than for the fear of Death, and he hoped if he might be spared, that he should become a new Man: of which he gave at present very probable Signs. Ralph Harrison, he was Born in Shoreditch Parish, being now about 20 Years of Age. He was placed an Apprentice to a Broad-Weaver, with whom he tarried two Years, and then Run away from his Master: he said that for two Years past he had been enticed into Bad Company, who brought him into the acquaintance of Lewd Woman, which was the cause of his breaking the Sabbath; and by that means gave himself over to all manner of Exceess; as Drunkenness, Swearing, &c. But if he might escape for this time, he would go to Sea to avoid such evil Courses. Henry List, was Born in Stepney Parish, being now 19 or 20 Years of Age, he said that he was not educated upto Knowledge, and therefore could not so fully express himself in Religious Matters, he served a Weaver for some time, who gave him the residue of it, in which he was Bound to him: that his own Father being Dead, his Mother and Father in Law, gave him all the good Counsel they could, but he would not be ruled by them; for which, he said, God had justly brought upon him this Punnishment; which if he should Escape, he would amend those Evil course of Life: he farther said that he was not acquainted with Harrison till after the Burglary committed by him. The next Person whom the Ordinary Visited as well in his Chamber, as exhorted and Prayed with him among the other Criminals, was Cap. George Baker, who did not make so large a Confession as the forementioned Criminals: yet this he acknowledged that he was Born of creditable Parents, who were of a plentiful Estate, and brought him up not to any Employment, only he lived a Life of Ease as a Gentleman, which was his Misery, especially his Parents declining afterward in their Estate: so being reduced to Straits for a Livelyhood he served formerly as a Voluntier beyond Sea, and so signalized his Valour, that meeting with six French, who Confronted him riding toward Nancy, he Killed one of them, and put the rest to Flight. The Ordinary asked him how long he had beset Travelors in England; he did not state the set time, but said, he had used that course of Livelyhood for some time, yet he never Murthered any Person: the Ordinary replied that he was more oblieged to thank God for his preventing him in such an horrid Act, than to impute it to any thing else. There was some Discourse used with him to convince him of the Heinous Crime of Robbery; tho it were occasioned out of Poverty even therein; a Person Assaulting another must first offer Violence to his own Conscience, and the Laws of humane Society: but it is an Aggravation to Rob out of Wantonness of Spirit, to furnish with Materials to indulge themselves in Luxury, and to follow the chase of Robbing as a Trade or accustomary Delight. He said he repented of his evil Life, but he had confess’d his particular Sins to God, and, hoped, had made his Peace with him, through the satisfaction of Chirst’s Death: yet he said that he feared not Death, for he was assured of Eternal Life. The Ordinary replied the Hearts of Men are apt to Deceive themselves, and therefore the surest way would be to mistrust his own Heart in such Assurances, in as much as he could never enough repent him of his Sins. The next Person that confess’d to the Ordinary, was Tho. Fallowfield, who Murthered a Young Maid: see the ground of his Malice in his Trial. The Ordinary would have taken him apart to have made him sensible, but the Crime is very Soul hardning; and so it proved with him; for he refused to give any account of his former course of Life; and tho Exhorted to Repent, shewed little or no signs thereof; so he must be left to the Tribunal of God, to pass his deteminate Judgment upon him. About 9 or 10 of the Clock in the Morning Thomas Fallowfeild, was put into the Cart at Newgate, he seemed very Penitent all the way he went to Leicesterfeilds, where the Ordianry [sic] Prayed with him and Sung a Psalm, after which he was Executed, the rest of the Prisoners where put into the Cart about 10 or 11 of the Clock, they all seemed very Penitent all the way they went; when they came to Tyburn Mr. Ordinary Prayed with them and Sung a Psalm, after which, they Exhorted the standers by to take warning by their Dismal Ends of the Effects of Sin; which had brought them to that Place. And they all Prayed earnestly to God that he would forgive them their Sins, and desired the People to Pray for them, after which they were all Executed. Dated the 4th. day of March, 1685. Samuel Smith, Ordinary. LONDON, Printed by George Croom, at the Sign of the Blue-Ball in Thames-Street, over against Baynard’s-Castle. 1684. 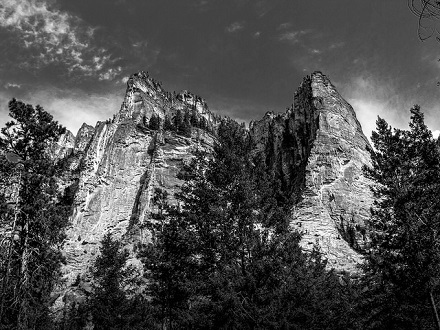 Lured west by prospecting’s siren song, explorers struck gold in Idaho in the 1860s and poured in, dragging in their wake the lawlessness characteristic of boom towns. The Bitterroot Mountains. (cc) image by Eric Gross. But the hills held other treasures than merely retail markups. A day after Magruder’s slow pack train set out, three rough frontiersman — our three men, Howard, Low(e)ry and Romaine — left Lewiston, too. Overtaking Magruder on the road, they joined his traveling party on an amiable basis; by the time they reached Virginia City, Magruder trusted them to help sell off his mining supplies. Business complete, Magruder was ready to return to Lewiston, he had $25,000 in gold revenue in his pockets and not an inkling that the boon companions he now hired as his guards meant to take it from him. That’s the gold … that’s what it makes us. Deep in the mountains one night, the wicked trio — joined by a trapper, Billy Page, who was inducted into the plot (so he said) by means of the sure understanding that to refuse was death — murdered Magruder and four other men traveling in the party. The murderers made for the coast, slipping quietly back into Lewiston and grabbing the first stagecoach out in the morning, en route to Portland, Ore. But a friend of Magruder’s, sensing in their furtive and ill-favored manner — buying tickets in disguise; heedlessly abandoning valuable mules and camp supplies — something of their villainous design, set a Javert-like pursuit upon their booted heels. He would pursue them at his own expense, leaving behind the inn he operated in Lewiston, all the way to San Francisco whence they journeyed to have their gold shavings coined by the mint. Page earned his freedom for giving evidence against the others; the remaining three attained the distinction of suffering the first legal executions in the history of the Idaho Territory. * Letter dated Jan. 1, 1864; it was published Mar. 24. ** Today a hamlet (Wikipedia pegs its population under 200) in the state of Montana; at the time, a Wild West boom town in the Idaho Territory whose tenuous order was maintained by a vigilance committee. On this date in 2009, Yemen police executed Abdullah Saleh Al-Kohali for machine-gunning a mosque at Bait al-Aqari village. Despite what one might assume, Al-Kohali wasn’t a terrorist. No, he was after a fellow clan member named Belal Al-Kohali over an affair of honor. “He got my sister pregnant three times,” the killer complained to the court. He did indeed manage to kill Belal Al-Kohali during weekly prayers … along with five other people who died on the spot, and four more besides them mortally wounded who later succumbed to their injuries. The typical turning-point execution features an illustrious protagonist upon the scaffold: a royal dethroned, a politician overthrown, a revolutionary laid low. On this day in 1771, an obscure woman executed for everyday crimes launched a new era in Japan. The Kyoto resident, nicknamed “Aochababa” — roughly translated as the Green Tea Hag — sparked a scientific revolution that would span decades, push Japan into its own Age of Reason called Dutch Learning, and keep an island nation astride goings-on from thousands of miles away in spite of isolationist practices. The Tokugawa Shogunate, which ruled Japan from the early 1600s through the mid-1800s, was widely regarded as anti-Western for closing down trade with several European nations. The execution of Aochababa itself is practically forgotten: she was hanged in Kyoto’s Kozukappara (the present day Arakawa ward) in Meiwa 8, the second year of a 15-year drought gripping Japan. Her crime is unknown, and her execution would have been as un-noteworthy as dozens of others that year had her body not been secured for science. However, under the reign of (though little due to) Shogun Tokugawa Ieharu, Dutch influence was increasing dramatically in Japan. Ryotaku opened the book and explained according to what he had learned in Nagasaki the various organs such as the lung called “long” in Dutch, the heart called “hart,” the stomach called “maag” and the spleen called “milt.” They looked so different from the pictures in the Chinese anatomical books that many of us felt rather dubious of their truths before we should actually observe the real organs. Comparing the things we saw with the pictures in the Dutch book Ryotaku and I had with us, we were amazed at their perfect agreement. There was no such divisions either as the six lobes and two auricles of the lungs or the three left lobes and two right lobes of the liver mentioned in old medical books. Also, the positions and the forms of the intestines and the stomach were very different from the traditional descriptions. After the dissection was over, we were tempted to examine the forms of the bones too, and picked up some of the sun bleached bones scattered around the ground. We found that they were nothing like those described in the old books, but were exactly as represented in the Dutch book. We were completely amazed. In short, their medical results matched those of the Dutch and flew in the face of a millennium of Chinese anatomical teachings. Genpaku was intrigued. As he tells it (40-some years after the fact), Ryotaku, Jun’an, and he immediately laid down a plan to translate the Dutch text into Japanese. The process was a slog. Lacking a dictionary or translator for anatomical studies, the team — bolstered by the Shogun physician Katsuragawa Hoshu — was forced to reverse-engineer the Dutch language using a short phrase book, occasional contacts with the Dutch themselves, and a host of educated guesses based on the anatomical features they were attempting to describe. In addition to the problems of simple translations — turning a language with definite and indefinite articles into one with no such concept — many anatomical features had never been named in Japanese before; Genpaku and his collaborators invented dozens of words just to get by. A brief history is given here. 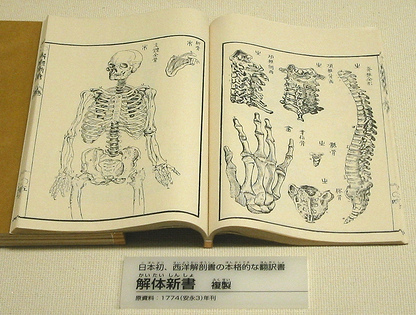 An image (more can be seen here) from the 1774 Japanese anatomy treatise. Topical historical literature, recommendation via Reddit. Genpaku was at the forefront of Dutch Learning, and his second masterwork, Rangaku Kotohajime (“Beginnings of Dutch Learning”), published in 1815, provides a thorough description of the events which led to these advances in science and medicine in Japan. It would be 80 years before the United States Navy forced its way into Japanese harbors and used gunship diplomacy to end Japan’s seclusion. During that time, the Japanese reproduced everything from telescopes to automata to steam engines using borrowed texts and dissection of imported goods. Dutch Learning kept Japan abreast scientific advancements even while it maintained its isolation. The enduring legacy of Dutch Learning was the late-19th century Meiji Restoration, wherein a Japan now officially opened swiftly modernized efficiently enough to trounce Russia in the Russo-Japanese War at the end of the century. A fairly complete description of the evolution of Japan under Dutch Learning is given in Wakabayashi’s Modern Japanese Thought and De Bray et al‘s Sources of Japanese Tradition (Vol 2). Today, many of the Dutch words imported to describe new objects, anatomical and otherwise, remain in the Japanese language as a testament to Dutch Learning. Sugita Genpaku is also the namesake of a modern-day attempt to translate texts to Japanese. And Toyo Yamawaki, through his help with dissections of the era, prompted an interesting ritual of memorializing cadaver donors in medical schools. For physical specimens, a museum with sections devoted to Dutch Learning can also be visited at Nakatsu. * The Dutch were allowed to stay because they weren’t Catholic. The Shogun also enacted laws forbidding missionaries and Christian prosteletyzing, as well as officially outlawing the practice of Christianity; however, an underground group of Christians remained in the country. ** Initially, all foreign texts were outlawed. However, beginning with Shogun Tokugawa Yoshimune, Dutch texts were allowed into the country, generating a new wave of books that were, for several decades, largely illegible to their owners. To go with the anti-Christian theme, however, the Japanese authorities continued to blot out all Christian references. † Translation by Ryozo Matsumoto, available here. ‡ Kanbun is a mapping of Chinese ideograms and writing style into Japanese-comprehensible language using classic symbolic meanings (a standardized shape to represent a tree) and sound equivalents (using the same standard shape to represent the the sound of the word “tree” rather than its meaning), as well as sentence structure and purpose markings. Using this style, direct Chinese-to-Japense translation is possible, but the onus is on the author to properly annotate the text. § Strangely, there is as yet no Dutch-Japanese dictionary in print.